Best Buenos Aires Places presents the famous Elizabethan style English Tower, now called the Monumental Tower located next to the Plaza San Martin in Barrio Retiro. The English Tower (Torre de los Ingleses) is the contribution of British residents from Buenos Aires to commemorate the 100th anniversary of the Argentinean revolution of 26th of May. It was a generous attempt to express thankfulness to the newly adopted country for the opportunities it offered to British community. As the matter of fact it was not an isolated act of appreciation because other communities of immigrants (Italian, Spanish and German…) came up with similar tributes. 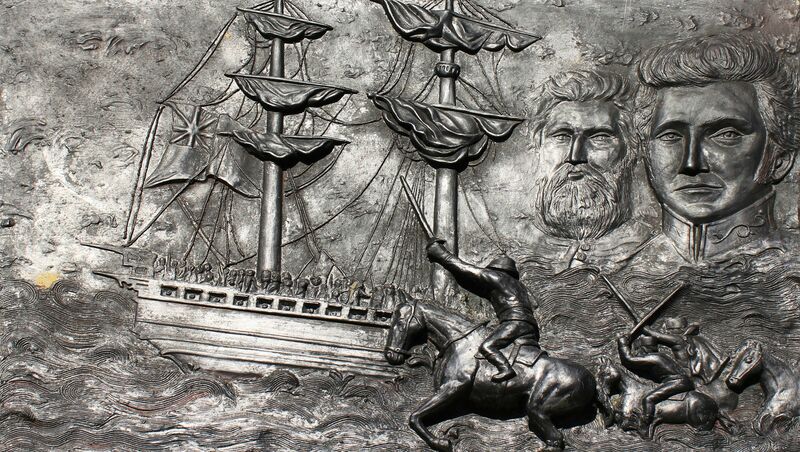 For example Italians raised the monument to Garibaldi in the center of the Plaza Italia). Situated in the center of the British Square (Plaza Britannia) in front of the railroad station Retiro, the tower was designed by an English architect Sir Ambrose Poynter. As an “all-British” donation, the tower was built by British engineers Hopkins and Gardom, entirely with materials imported from England (only sand and water were local). The tower’s cornerstone was laid in late 1910 but it took long 6 years to complete the structure which was finally inaugurated on May 24th, 1916. The square-footprint tower is built in an Elizabethan-style and reaches the height of 75.5m (247ft). It is topped by an octagonal copper-roofed cupola. The tower stands on a platform with the access stairs on each side. The main entrance on the west-side is decorated with the emblems of the British Empire –Thistle of Scotland, Tudor’s (English) Rose, Welsh Dragon and Irish Shamrock (three-leafed clover). It can be translated as “To the Great Argentinean Nation (People) from the British residents, May 25, 1810-1910”. On the upper part of the tower just above the balcony there are four quadrants of the clock and five bronze bells. The biggest bell is a replica of the Westminster Abbey one – for that reason the tower is sometimes called the Argentinean Big Ben (or Argentinean Clock Tower). The weather vane crowning the dome represents the British frigate from the time of Queen Elizabeth. During late 1990’s the tower underwent a well deserved restoration. The most impressive part – a glass lift with the original British machinery opened to the public access the 6th floor offering the panoramic view over the district of Retiro. In 2006 the upper levels were once again closed and sadly it seems that nothing changed as of January 2011. In 1982, after the Islas Malvinas/Falklands Islands War, the War Memorial was established across the street on the Plaza San Martin. The names of fallen Argentineans soldiers engraved on the red marble are a permanent reminder of the British battle with Argentina. Consequently the English Tower was renamed Monumental Tower (Torre Monumental) and the British Square changed the name to Plaza Fuerza Aérea (Air Force Square). We should only hope that the history will not repeat itself. Commemorative Inscription in front of the English Tower seems to relate to the 19th century British invasion. In fact it was here where the local forces defended the city from the attack (subsequently the area was named "Fields of Glory"). Left - Main entrance to the tower, right - famous Buenos Aires Railroad Station - El Retiro. Las Malvinas/Falkland Islands War Memorial facing the English Tower located just across the street. Right - view from the back of the Memorial towards the English Tower (Monumental Tower). And here is ending our Plaza San Martin walking tour offered by Free Best Buenos Aires Places Pictures. Certainly I would like to encourage everybody having chance to visit Buenos Aires to reserve at least one entire day to fully appreciate this beautiful historical area. Hasta la Vista Amigos ! I also hope that you enjoyed the tour and possibly will come back to these pages to refresh your memory, take some shots (pictures) or prepare yourself for the trip to Argentina.